Honey's bikes for women are function-specific, well-defined, specialty bikes for dedicated purposes. Honey's line includes over a dozen bike styles each designed for a very specific use and a woman's body-type in mind. No Honey bike for women is a re-purposed men's bike. No Honey is a general use, try-to-do-everything bike. Honey designed each women's bike style and functionality from the ground up—including tubing choices, bike fit, handling, and components—for a very specific and narrowly defined purpose. We design for women based on feel of contact points, fit of the frame, and fit of the components. Please read these sections before choosing your ideal bike model. Honey's approach to design is very comprehensive. Not sure which model might be right for you? Or want more information about a specific model? Email the Beekeepers. Weather: This is Honey's all-weather training bike series. Honey Weathers come with long-reach brakes. Cyclocross CX1 Disc: Honey's disc-specific cross race bike specifically designed for 10x1 or 11x1 gear setup. Low-maintenance, all-performance, and perfect for the harshest of conditions. This may be the perfect New England race bike. Cyclocross CX1 Canti: Honey's cross race bike specifically designed for 10x1 or 11x1 gear setup. Faster, lighter, tighter, and simpler. The perfect contemporary cross race bike. Cyclocross Singlespeed Disc: Racing singlespeed cross demands every watt of power to be transferred through the frame to the rear wheel. We've designed the Honey Singlespeed to deliver on this promise. Stiff light and simple, the Singlespeed Cross may be the perfect race bike. The disc version of our Singlespeed is best suited for harsh weather and the toughest race courses. Cyclocross Singlespeed Canti: The Singlespeed Canti delivers the same promise as the Singlespeed Disc but this bike is significantly lighter. This bike is ideally suited for fast courses that require optimal acceleration. This bike loves run-ups and to be shouldered because it's so light. Packmule - Drop Bar: The Packmule is Honey’s all purpose bikepacking machine. The Packmule can go just about anywhere and handle just about anything. It’s not the fastest bike that Honey makes but it is the bike that promised the most adventure per mile. Tandem Road: Designed to fit: with 27 size options, the Honey's fully loaded tandem series is ready for serious multi-day riding. Honey Road Tandems include disc brakes and are ready for fenders and front and rear panniers. Mountain 26": Contemporary hardtails available in 12-sizes with innovative frame tubing design. BiFrost: Our dual wheel offering that you can ride with either 26: fat tires or 27.5” plus tires. The bike works equally well with either tire system. This is an all season bike for all kinds of terrain. The Busy Bees at Honey—some of whom are women—have been designing and building women's bikes, for various companies, for nearly 20-years. Honey sees important differences between women's and men's bikes and bodies. That's one reason that Honey offers such a wide range of women's bikes—with more than 30 women's models from which to choose! In fact, every model Honey offers for "men" Honey also designs specifically to fit a woman's body. Honey also knows that the idea of a "women's bike" or a "men's bike" is a bit of a fallacy. Some women fit really well on "men's" bikes and some men are better fit on "women's" bikes. Feel: Honey tailors the bike's contact points—saddle, handlebars, and controls—specifically to a woman's body. These adapted contact points will be more comfortable. Fit of the Frame: Achieving the best riding position begins with the correct frame size and shape. A Honey guarantees a better fit than any other stock bike because Honeys come in 12-sizes—and 11-styles. This allows the rider to choose between a few sizes—thereby getting the best fit. Improved frame fit helps reduce overall fatigue, back pain, hip issues, and lots of other problems. 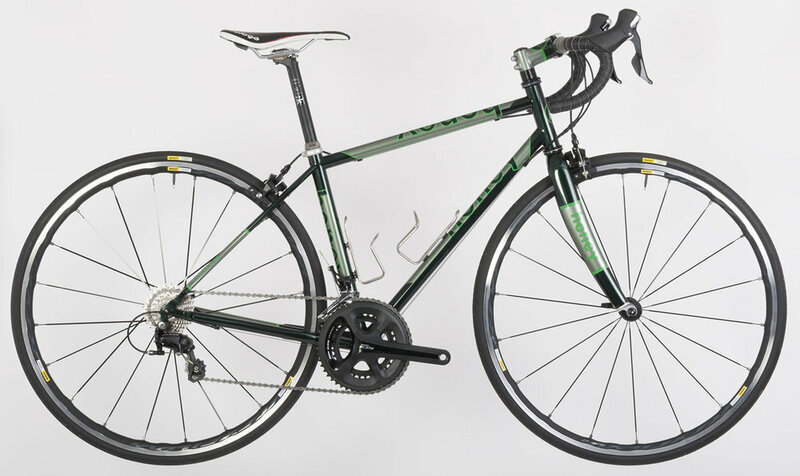 Fit of the Components: Honey fine-tunes the riding position by choosing the correct female oriented components, including gender-specific stem length and angle, saddle type, handlebar width and reach, and controls—brakes and shifters—size and shape. This helps alleviate shoulder pain, hand numbness, hip problems, and lots of other issues that can arise from a poorly fitted bike. Staci focused on paint detailing for a Honey frame. Saddle: Honey bikes for women often come with a slightly wider saddle, because a woman's hip bones tend to be wider than a man's. Of course, saddle feel is a very personal choice; a wider saddle isn't universally the ideal choice for every woman. If you have narrower hips, a narrower saddle—often considered a "men's" saddle—might feel better. Handlebar & Controls: Honey bikes for women come with a narrower handlebar, in many cases. This is because a woman's shoulders tend to be narrower than a man's. And sometimes, when appropriate, the Honey has different brake and shifter levers—depending on the bike model and size. Shoes: Shoes are the third contact point, and Honey doesn't offer shoes. We recommend that you work with your favorite local retailer to try some shoes and have them professionally fit. Of course, these are generalizations, and it would not be ideal for every woman to have these component alterations be applied to every Honey bike size, in every Honey bike style, for each Honey series. Honey applies these rules when and where they are appropriate and they provide a better bike riding experience. Choosing the right frame size is the first step to getting the ideal fit. Fortunately, because Honeys come in so many sizes and shapes, you can choose the best possible match of handlebar reach and height, relative to your saddle height. One of the benefits of all the size options is a reduction in overall fatigue, back pain, hip issues, and lots of other problems. Honey not only chooses component contact points specifically for women, Honey also places those points in space, better for women's bodies. Honey Saddles for women are typically slightly more forward, for better pelvic rotation and a slightly more upright feel. Stems on Honey bikes for women usually provide a slightly higher handlebar height which helps open up lungs and torso; the stem choice also helps reinforce improved pelvic rotation. Women's Honey Handlebars have a shorter reach and narrower width—when appropriate. This helps reduce shoulder fatigue and other upper body and arm issues. The rider's Controls—brake levers and shifters, where appropriate—on Honey bikes for women may have a slightly smaller and more natural fit. This improvement can help reduce hand fatigue and numbness, and arm and shoulder pain. These design points, along with a lot of science, make up Honey's extensive women's bike line.